The Easy Day Thailand team is a group of friends and families who’ve known each other for over 10 years. As we worked and socialized together in Phuket we dreamed of owning our own company to share our experiences and love of Thailand with the people we meet. We knew we could provide a better service than what was available and that’s what we now do. We pride ourselves on giving a professional service while still maintaining that personal touch. We are not just a cold, impersonal website, we are real people sharing our years of experience and we enjoy meeting our guests in person for one-on-one discussions whenever possible. Once we get to know our guests, we customize our tours to meet our guests desires and give honest advice based on our experiences. Our promise to you, our guests, is that we have visited every destination that you see on our Easy Day Thailand web site. Every 3rd party activity we promote on our site we have either done ourselves or have the recommendations of close friends who have shared their experiences with us. Easy Day Thailand packages are for everyone. Families, friends, couples and singles! Why do we know that what we offer is exactly what you looking for? Families – We have families with young kids and we travel with them throughout Thailand, so we know what you need. Friends – We are friends and like to travel together. Couples – once we were couples and understand the dreams and desires while travelling. Singles – Yes, some of us are still single and very willing to give advice. Ingo is our families expert at Easy Day Thailand. He and his wife Gung have two boys, David and Alex. They live together with Grandpa Opa in Phuket. If you want to know the best hotels, beaches, restaurants or entertainment for a family in Thailand, ask Ingo. Ingo is a fitness fanatic who likes swimming, mountain biking, scuba diving and kite surfing. At least that’s what he tells us after a few beers at his weekend bbq parties. If you want a home cooked German feast come and have dinner when Opa is cooking. If you want to learn to cook real Thai food Gung is the perfect teacher. You will never go hungry at Ingo’s. Diego is the man who can, our very own Mister Fixit. He and his wife Malila are the people to ask if you can’t find the solution anywhere else. They can usually organise anything for you. They have all the contacts all over Thailand, from as far south as Trang to as far north as Chiang Rai. They live in Kathu with their daughter Julianna. Diego recommends a ultra high carb, high fat diet with minimal exercise. His “cuddly” physique is proof enough that it works. Diego speaks Italian, English, French and Thai, often all at the same time. We all love Sri. She’s wonderful, charming and beautiful. (Khun Sri is the Director who pays our salaries). Sri is from southern Thailand and lives in Phuket with her husband Joey and twin babies Pino and Carla. If you want to do some Phuket shopping for clothes, furniture or jewellery we recommend talking to Sri first. Francesco is another young handsome Italian guy that all us old farts are jealous of. While we are in the office he gets to go Scuba diving from time to time with whale sharks and manta rays! 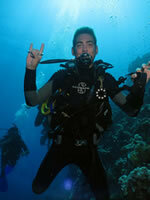 Book a Phuket scuba diving course with us and you may meet Francesco. Need an Italian, French or Spanish speaking dive guide? Franscesco is your man. 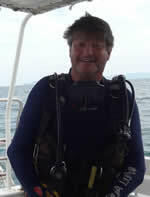 Paul is our expert on Thailand liveaboard diving to the Similan Islands and surrounding areas. He also likes to travel around Thailand and Asia so if you have any questions about other destinations just ask. He is married to Sopa and they have a young son, Daniel. Paul’s mountain bike has taken him all over the island and he only falls off it about twice a week. He says he looks cool in his lycra cycling shorts and denies that he’s having a mid life crisis. Andreas comes from Germany and is our man for Scuba Diving. He has almost twenty years of experience diving in the Andaman Sea from Burma through the Surin and Similan Islands down to Phuket dive sites of Racha yai and Racha Noi, Phi Phi and Koh Haa and even further south too. There is nothing that he has not seen and his years of experience have not dampened his enthusiasm one bit. In fact he loves it more today than ever. Getting him off the boat is a chore itself. Andreas loves finding the small critters for his divers, only recently he has spotted several different species of Ghost Pipe Fish and Nudibranchs. He has introduced so many people to Manta Rays and Whalesharks that he is on first name terms with many of the large pelagics that cruise these waters, and has secured his named in Phukets dive folklore for all time. When he is not on the boat, Andreas is busy working on websites for us and with his vast experience he is proving to be a major asset to the company. Barbie is from a famous Island called Koh Panyee, and she applies all her traditional beliefs and customs to her work. Barbie loves to go and check out all the tours herself some of her favourite are The Phang Nga trip and Phi Phi Island tour. She works in our Kathu office with Diego and Francesco; they say that they would be lost without her. Barbie is our chief accountant and makes sure all the bills and staff gets paid on time. 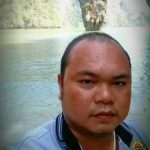 Fon is from Phang Nga and has been living and working here with us for over two years now: Fon is in control of the day-to-day booking of trips and making sure all our guests get picked up and taken to their correct destinations. Fon always has a smile on her face and is ready to talk with you whenever you like. And you can always find her behind her computer working away in our Easy Day Thailand office in Chalong. Nong is the office secretary in Chalong, constantly busy she hardly has a moment to herself always working. Nong is from Koh Panyee, which is a very special fishing Village in Phang Nga Bay. She has been working for Easy day for over a year now and we are so happy she decided to move from her special Island. Nongs sisters Barbie also works for Easy Day Thailand too. All our guides at Easy Day are licensed guides, who speak very good English, Italian, German, French and Chinese. Ti is one of Easy Day Thailands Tour Guides, coming from Phang Nga Province. He is working more then 19 years in the tourism industry so has plenty of experience as Tour Guide. As he loves his job he always does his best to make sure every tour is as good as you expect it to be. Guide Ben is with Easy Day Thailand for quite a while and she has as all our other tour guides a few years experience and she loves what she is doing. 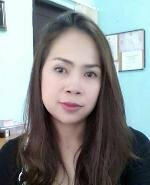 She speaks fluent English and is always happy to answer questions. 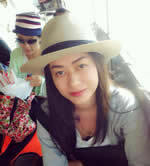 Her favourite tour are Phuket Island Sightseeing Tours. 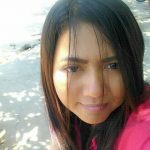 Bee is also a tour guide, she is originally from Nakhorn Sri Thammart and has been living and working here for over four years now. There is not a trip that she is not an expert on and loves answering any questions you might have. 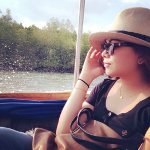 Bee loves working for Easy Day and here favourite trips are to Phang Nga bay area, Racha Islands and Phi Phi. She is always smiling and speaks excellent English. Bao went to Italy and learnt the language in order for him to back to Phuket and work as a tour guide especially for our Italian guests. He has been with Easy Day for over two years and he takes care of all our Italian guest he also speaks some English. He loves his job as a guide and is very popular with all those he takes care of while they are on holiday. Adriano is the real Italian Stallion of Easy Day Thailand (sorry Diego). 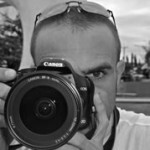 Adriano has many strings to his bow, one of which is his fantastic underwater photography. Have a look at them here: Underwater Paparazzi. 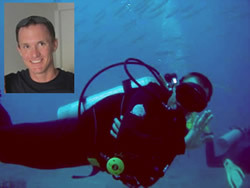 If you want to learn about underwater photography he’s the best person that we know to teach you.